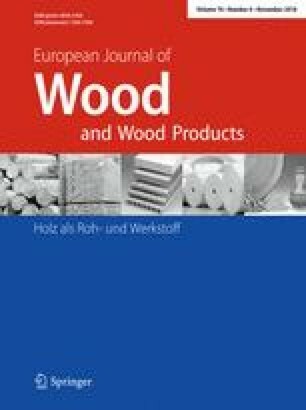 Dyeing of veneer is an important value-adding process, particularly for young plantation hardwood species, which often have uneven colour and “dull appearance”. An important indicator in the assessment of the performance of veneer dyeing process is the dye uptake. This study compared two different methods of measuring dye uptake of dyed veneers; by using either liquid uptake based method or spectrophotometry method. The study revealed that there was a significant difference in the percentage of dye uptake determined by the two methods, but the overall results in the correlation between the percentage of dye uptake and the dyeing parameters had a similar trend. The authors are grateful for the support of the Australian Centre for International Agricultural Research (ACIAR), the University of Melbourne, School of Ecosystem and Forest Sciences, and RMIT University, Centre for Advanced Materials and Performance Textiles. Australian Bluegum Plantations of Victoria are also acknowledged for providing the plantation resource, assistance with labour and equipment and access to the trial site. The authors are indebted to those working at Salisbury Research Facility Centre, Department of Agriculture and Fisheries, Queensland, Australia for their great help in the specimen preparation and guidance.